When it comes to dining trends, there's retro and then there's really retro – we're talking recipes inspired by ancient Roman banquets and even by the Bible, and perhaps not surprisingly, we're talking about Israel. If anything, it’s the creative “New Israeli” style of cooking that has grabbed headlines in the international culinary press in the past few years, but some of the hottest tables in the Holy Land are actually drawing on the gastronomic charms of a very distant yesteryear to keep things fresh. Case in point, the bold new ancient menu at Helena, a seaside restaurant that’s not in trendy Tel Aviv or storied Jerusalem but actually inside Israel’s Caesarea National Park. There is an ancient Roman amphitheater here and ruins aplenty, but don’t be content to play the part of the dutiful tourist because to do so might mean missing out on young chef Amos Sion’s adventurous undertaking. Much like Material Girl Madonna consulted ancient scriptures to plug into the mysteries of Kabbalah, Sion (pictured) dipped into recipe books older than the Wailing Wall to concoct dishes that could well be the most memorable thing about your trip to these parts. First, there’s his ridiculously tangy, chewy bread that comes out of a traditional taboon clay oven. Dip some in olive oil and you’ve set the stage for roast lamb wrapped in a celery seed and garlic lemon zest with apricots, almonds, and thyme ($11) or foie gras on fig pastry in coriander seed syrup, cooked in the taboon ($15). 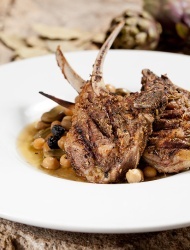 Or nourish your inner Julius Caesar with lamb chops in fennel seeds, sumac, and bay leaves served with chickpeas cooked in a saffron chicken stock ($32). The Romans never neglected seafood and neither does Chef Sion, who has earned his chops cooking at some of Israel’s best tables. Many ancient Roman dishes made use of garum, a sort of fish sauce made from the intestines of little fishes which were then macerated in salt and cured in the hot Mediterranean sun for up to three months. At Helena, Chef Sion serves up fresh mussels in garum along with leeks, cumin seeds, butter, and, to bring the yum factor to the max, a honey-infused wine reduction ($23). Less intense but also interesting is the catch of the day served with juniper and a Muscat wine sauce, on a bed of wild creamed spinach ($33). For dessert the Romans basically liked to beat small countries into submission so that everybody’s roads would lead to Rome, so don’t expect a laundry list of after-dinner sweets at Helena. However, the chef’s ricotta cheese balls are amazing, made as they are with olive oil-fried semolina with a cardamom and date syrup dipping sauce ($10 for a generous serving of the balls). You can order each dish separately, or (my recommendation) splurge on the Roman Feast Meal which includes all the above dishes served at the center of the table for $50 per person. Note that to access the restaurant you must pay a $3 entrance fee to the harbor, but hang on to your receipt because it will be reimbursed by the restaurant. From overseas, call 011-972-4-610-1018 to reserve. Over in Jerusalem you're in the original Bible Belt and unlike in most places with Biblical associations, here you can have those associations and sometimes feast on them, too. Particularly if you're dining at Eucalyptus. Here, chef Moshe Basson takes inspiration from herbs and plants that are mentioned in the Good Book (and I don’t mean The Joy of Cooking). He also forages for them on a regular basis in the Judean Hills just beyond the old city walls and creates a menu based in part on what he finds. Think za’atar (hyssop), or Jacob and Esau’s Biblical red lentil stew, or Jerusalem artichoke soup with almond milk, or (my favorite) Hubeza salad served “in the style of the siege of Jerusalem.” Above all, think divinely delish. Find Eucalpytus at 14 Hativat Yerushalaim St., 011-972-2-624-433. To return to our sheep, as they say in French (revenons à nos moutons, lest you think I’m making up that expression), a quick word about that aforementioned New Israeli cuisine: in Tel Aviv, you don’t want to miss power chef Omer Miller’s new table called, appropriately enough, Table (or Shulchan in Hebrew). It’s located on trendy Rothschild Boulevard and the menu is emblematic of the way many Israeli chefs marry ancient ingredients with new kitchen trends. Consider his cherry tomato gazpacho with calamari salad, cucumber, and white horseradish or grilled amberjack with pappardelle, white wine, and parsley. 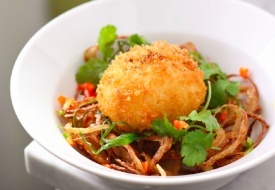 Comfort food goes orbital with Miller’s signature egg schnitzel (pictured) with crisp shallots, spring onions, Thai vinaigrette, and garam masala, a veritable snack-sized showstopper. This dining hall (incidentally, Miller has another restaurant in Tel Aviv, called Dining Hall) draws the likes of Bar Refaeli and other moneyed Israeli hotties meaning reservations are a must. Table is located at 73 Rothschild Boulevard, 011-972-3-5257171. For general trip-planning information see our Israel destination guide, then use our Travel Search price comparison tool to find the lowest rates on flights, hotels, vacation packages, and more.